Stan Goldberg (born May 5, 1932) was an American comic book artist, best known for his work with Archie Comics and as a Marvel Comics colorist who in the 1960's helped design the original color schemes of Spider-Man, the Fantastic Four and other major characters. He was the National Cartoonists Society Hall of Fame inductee for 2011, which is accompanied by the organization's Gold Key Award - presented to Goldberg on May 26, 2012. He passed away on August 31, 2014 at the age of 82. Stan Goldberg was so very kind when I called him about his time as a student of Jerry Robinson and the longer we talked, the more I realized I had another interview on my hands just from the friendly, open way he was sharing some memories. He was a true gentleman and I was saddened when he left this world. He even sent me a pencil sketch of Archie with his edits to the transcript and it's a gift I treasure. This interview originally took place over the phone on January 7, 2008. Stan Goldberg: We think we do the right thing all the time and everybody else does the wrong thing. And that’s true. I do the right thing all the time. Amazing Spider-Man (1963) #1, cover penciled by Jack Kirby, inked by Steve Ditko, & colored by Stan Goldberg. Stroud: Right. I actually got Steve to send me a little note about what Jerry was like as a teacher to him. Stroud: Yeah, I about fell out of my chair. SG: There you go. What is this for? A book you’re doing on Jerry or a magazine article? Stroud: Actually, I write up comic reviews and interviews for a webpage dedicated to DC’s Silver Age and of course Jerry goes back into the Golden Age, but still, you wouldn’t have a Silver Age without the Golden Age. Marvel Super-Heroes (1967) #12, cover penciled by Gene Colan, inked by Frank Giacola, & colored by Stan Goldberg. SG: Jerry and his wife, Gro, I’ve known them forever and it’s one of those few guys that are still around that you could touch bases with and…another interesting side bar, many years ago, we go down to Mexico every year. A little town called San Miguel, and the first time we went down there about sixteen years ago, we spent a couple of months there every winter. I met the great Frank Robbins, who lived down there. Stroud: Oh, I’ll be darned. Stroud: Oh, yeah, talk about some living history right there. That had to be just wonderful. SG: It sure was. So, whatever else I can tell you just shoot and I’ll try to answer a question or two. Stroud: Okay. Well, thank you so much. When you took the classes from Jerry what sort of principles did you take away from your time being his pupil? 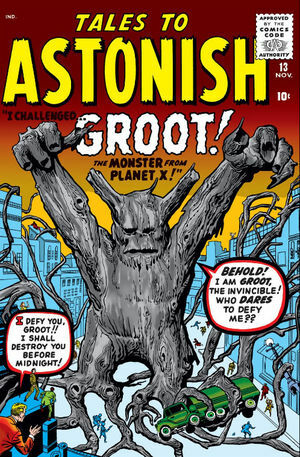 Tales to Astonish (1959) #13, cover penciled by Jack Kirby, inked by Steve Ditko, & colored by Stan Goldberg. SG: And Jerry’s art…he wasn’t one of the ordinary, good artists, he was better than 99% of them, and I especially remember his war stories so well. It was so authentic and so realistic and he was magnificent. People remember him for certain things, but he was a good artist, really a great artist and it was so sad because the coloring we were able to do in those particular books at that time was so poor. So here Jerry was and everything was so authentic looking; the tanks and the uniforms and all that, but those were all colors that half the time you put down on what we used to call silver prints, you had to keep your fingers crossed and hope you got something close to that because it was very difficult getting the browns and the grays. Certain colors that demanded three or four of the major colors and a certain percentage of them to make this great gray uniform or the color of mud or the color of a plane. And half the time Stan [Lee] was telling me, “Look, its difficult getting those colors. I would have no problem if you made the tanks,” I’m exaggerating now, but more or less he said, “if you make the tanks red, you make one guy’s uniform blue and the other guy’s uniform yellow…” And here I was trying to be so authentic. I would go to the library and get the correct color, and I felt bad that Jerry was putting all this work in and I’m sure he realized, and he knew who I was, I was coloring his stuff, because I told him right off the bat that it’s difficult getting it right. In those days when the color of the paper in the comic book was almost a gray color, it wasn’t even white, then some of those colors would come through the pages. And up at Marvel, Timely at that time, it was quite poor. But that was the class and it was quite a kick to have there, as my teacher, was a guy that I was working on his stuff, and I knew of his work even before I came into the business. I was aware of his artwork. It was so distinctive and I loved it. What sticks in my mind mainly, as I continued working in the bullpen and ran the whole coloring department, I came into the job wanting to draw stories so Stan would give me little horror stories to do, little adventure stories and things like that, so I would do those things and maybe, I don’t know if I would bring them in and show them to Jerry. I have no recollection of that at all. I remember Steve Ditko being in our class and I got to know him quite well, fairly well at that time. We were all young guys and there were a few other artists that were around at that time. They didn’t stay that long in the field. They just maybe went on to something else, but there were three or four of us, some of them worked for Timely at that time, but Steve hung in there and I stuck in there and then the years roll by and in 2009 will be 60 years. 1949 to 2009, yeah, I think that’s 60 years. Stroud: Oh, it sure is. That’s a very good, long run, Mr. Goldberg. Journey Into Mystery (1952) #83, cover penciled by Jack Kirby, inked by Joe Sinnott, & colored by Stan Goldberg. SG: They can’t fool me, but they own up to it now. They said they read them, too. It’s fun. Stroud: Absolutely and as you said, it’s obviously treated you well all this time. SG: Yeah, it’s been a good career and paid all the bills. I’ve done lots of other things since and work for the major publishers was fine with me. It’s good to see your books on the news stand in the days when the independents; you can’t find them too quickly or the print run are small. You’d always see Millie the Model or Scooter and Binky from DC and then all the Archie books from Archie Comics. So it’s nice. Stroud: Oh, yeah. You definitely covered all the bases there and there was such a trend at the time it seems like because when Millie the Model and Binky came out it seems like they were also pushing similar things, knock-offs you might say, like The Maniaks and Angel and the Ape. SG: You can’t keep up with the young audience, because what they love today, tomorrow they’ll find somebody else that they’re in awe of, so if you can just keep close to them and I always liked to go to schools and work with the kids and talk to them and find out what they’re reading and what they’re enjoying and even something as recently as two weeks ago, I have a granddaughter who is 6 years old and she was having a birthday party and all her girl friends and a couple of her boy friends, they were also 6 years old, and she loves when I draw pictures for her. She likes to draw, too, and even though they’re just barely able to read now, but she knows all the characters so well. And at the party I was drawing pictures and she was describing each character, talking about Reggie and what kind of guy he is, because he’s not really a nice guy, but she says, “Yeah, he tries to get Archie in trouble all the time. He goes to Mr. Weatherbee and causes some problems, he tells Weatherbee what Archie did.” I’m listening to my granddaughter, and I can’t believe it. Maybe her dad, my son, reads some of the things to her, but she absorbs it. She’s a 6-year-old kid and she’s been doing it since she was 4 or 5 years old. Stroud: That’s terrific. And after all, my parents had the theory that any reading you’re doing is good and so they didn’t discourage me at all from reading comic books. SG: Exactly, exactly. That’s a foregone conclusion. When Stan found that out; Stan and I were close for a number of years when we were putting the stuff out. I cleared all the color schemes for all the super heroes from 1960 to 1965. A Date With Millie (1959) #1, cover by Stan Goldberg. Stroud: Oh, wow. Right in the thick of things. SG: Yeah, all those things, and when he started getting these letters from not only college kids, but their professors also, it opened up a whole world to him and there they were. He was doing what he loves to do and turning it out and creating all these great situations and there was a world that opened up and God bless him, he’s still going strong. Stroud: Yeah. I talked to Jim Mooney a few months ago and he couldn’t say enough good about Stan from when he was working over at Marvel in the 60’s and onward. SG: He and Stan were old, old friends. They went back many years ago. In the 40’s, I think, they were good buddies. I met Jim a few times and from what I gather from those few times he’s one of the great guys. Stroud: Very much so. He was really a delight to talk with and of the 17 or so creators I’ve had the privilege to chat with I haven’t run across anyone I haven’t taken a great liking to. SG: It’s an industry that…I can’t answer for anybody that’s come in the past 25 or 30 or 40 years, really. I don’t read the books at all. I can’t read them. I have a lot of problems with them; I’m not going to go into that, but the guys that I started working with and being at my age, these guys would survive with 10 or 15 years, they were the old-timers. Of course, they came in when they were quite young, guys like Bill Everett, Carl Burgos and Fred Kida and John Severin and people like that who I knew and worked in the bullpen with them for so many years. All through the 50’s anyway. Joe Maneely, who unfortunately died so suddenly. There was the ultimate tragedy in the industry. I was with him that day. He went home that night. He lived in New Jersey. He was on a train and he fell off the train, I guess went in between the cars and maybe had a little too much to drink that day, wanted to clear his head and fell off the train and there they found him, dead and still holding his briefcase. SG: But working with these guys; and there are a few of them that are still around. Joe Sinnott is still around, and he’s another one of those giants of the industry and John Romita, of course and on and on. There’s still a few of them. But with me, I’m the guy who’s just as busy now as I was 30 or 40 years ago, and I’m not complaining, it’s just that more time is taken up just going to see the doctor. Years ago, you just didn’t go to the doctor, but now any little thing, you go to the doctor. Stroud: Yeah, it’s one of those sad facts. As I told Jim, I heard a wise man say once that the Golden Years are filled with Lead. SG: That was the name of a comic strip I worked on with another old-time artist and we got pretty close. It was called The Golden Years, but this was awhile back and I remember the syndicate liked it, even though we handled it as the characters, the stars of the show, these Golden Years, they still had a mother and father. So, we treated them with love and respect and a lot of fun. We had a character that was 75 or 80 years old, and he still had to call his mother up every day to see if everything was okay. Binky (1970) #78, cover by Stan Goldberg. 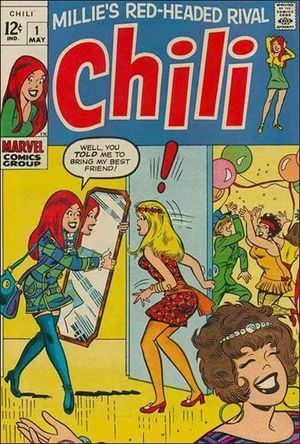 Chili (1969) #1, cover by Stan Goldberg. Date With Debbi (1969) #18, cover by Stan Goldberg. Stroud: (Chuckle.) I think we have similar attitudes. I quit reading them after the late 60’s. They just didn’t do anything for me any more and once in a blue moon I’ll take a peek at one and they just, they leave me cold. Everyone I’ve spoken to has been a Silver or Golden Ager, so we’re talking…I mean the youngest guy I think I’ve spoken to is Neal Adams. SG: I did something with Neal and his daughter a couple of years ago. There was a whole series of books. Archie meets a character called the Web and this is supposed to be coming out some place or other, but I hear about it, I got paid for it, and it’s over with. All these people I’ve been able to work with and some were so great and then they died. One was John Buscema, so there was probably the best of them all. And every time I say the best of them all, then I think of someone else like Jack Kirby, who was the best of them all, and I think of them as friends. People will say, “You knew Jack Kirby. You knew John Buscema, you knew this one. I said, “Yeah,” I said, “Why? Is that so important?” They were just guys I knew in the business. Some of these other people will ask, “What was this guy like, or that guy?” Well, we just worked to make a living. John Buscema would tell you that. Archie Meets the Punisher (1994) #1, cover by Stan Goldberg. The first 30 years that we knew each other, occasionally we’d see each other up in the office and we’d bring the work up to Marvel all through the 60’s and sometimes we’d get a cup of coffee and just chat for awhile and he’d go home. He was raising his family and getting his stories out and I was doing the same thing and then in the 90’s they got together and decided to do a book where Archie meets The Punisher. At the time it was kind of a joke, but it went well. People still talk about that. There was a sequel to it, but I think that was when Marvel Comics went into bankruptcy - I think, and so they held off on that and whatever, but it was good. It was a nice challenge, and Tom Palmer tied the whole thing together. He inked the whole book. John’s stuff and my stuff. SG: Oh, that’s my ace buddy. In fact, I have to call him. So, what did Frank have to say? Stroud: He was very similar in his thoughts. He said, “I felt really fortunate. I enjoyed what I did. I raised five kids, paid for the house, never starved,” but he said it was a living. SG: Sure. When I think about it, I raised three kids, had a house, two cars, and I tell my sons what I made in those years and they think I’m joking, you know? We went on vacations a few times and when a freelancer goes on vacation that means a non-paid two weeks. There’s nobody paying us when we put our pencil down. It’s as simple as that. But it was very important, those times away with my family. Stroud: Yeah. You’ll never regret it and they’ll never forget it. It’s a win-win all the way around. SG: I’m glad you reminded me about Frank. I gotta give him a call. He moved upstate, not upstate but to Maine. He lives up there now. Stroud: Yeah, he told me he’s got his place up for sale. He’s planning to move back to Long Island. SG: Hoping to. He misses hanging out with the cartoonists. We have a group of cartoonists out here on Long Island. We’ve been hanging together for about 30 or 40 years. It was started by Creig Flessel and Walter Berndt and Frank and a few other guys who were there in the beginning with all those guys putting it together. Stroud: I’d never heard of the Berndt Toast Gang until I got acquainted with Joe Giella and of course he’s very involved and tries to never miss a luncheon and he’s another superb gentleman. I really enjoy chatting with him. SG: We go back many years. We’re working on a few things together and we speak on the phone quite often and he’s one of the guys at the Berndt Toast. 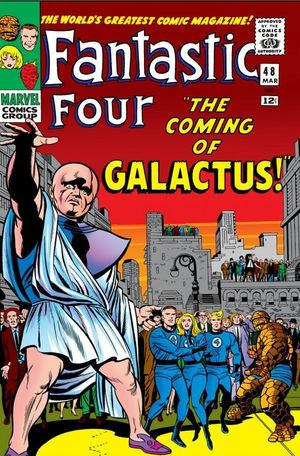 Fantastic Four Annual (1963) #3, cover penciled by Jack Kirby, inked by Mike Esposito, & colored by Stan Goldberg. Stroud: He tells me he keeps trying to get Carmine [Infantino] to come out and so far, he won’t do it. Stroud: He is. He was gracious enough to talk to me. SG: We were all in Italy together and Carmine was along and I don’t think he said two words. So, I just take it as it comes. However he feels that day. I like him. I loved his art. Stroud: We’ve had several conversations. SG: He and Irwin Hasen. They go back close to 70 years and both of them have always been bachelors and sometimes when they get together they fight and yell at each other like a man and a wife fighting. But that’s the way they are and Irwin is another interesting guy that I’ve become very close with over the years. Stroud: He was kind enough to chat with me just a little bit. SG: Irwin you’re talking about. SG: He had been ill. He got sick about a year ago. The first time practically in his whole life that he really came down with a big problem, but he’s back and I speak to him, in fact I just ordered his new Dondi book that just came out. Stroud: Yeah, I saw that and I was looking for a copy. SG: Yes, and I’ll be going to see him in a couple of days with the book to get him to sign it. He’s doing okay. He taught at the Kubert School for almost 30 years. Stroud: He was telling me about that and I was kind of surprised that he’d retired, but he just said that it was time. SG: Yes, at a certain time you just have to cut it loose. That’s the way it goes. Amazing Spider-Man (1963) #50, cover penciled & inked by John Romita Sr. and colored by Stan Goldberg. Stroud: I hit him up for his autograph and he very kindly put it on a little piece of card stock and did a head shot of Dondi for me, so that was sweet. SG: He’s one of those guys that can draw better now than 90% of the guys that are drawing pictures in his own inimitable style. He has a simplicity to his look and his likenesses of people are so good and he can tell stories with his pictures. Stroud: Exactly. And let’s see, your neighbor on the island there, Al Plastino, what a hoot. SG: I never met him. And there aren’t many that I haven’t met, of course. Stroud: He’s just a pistol at 86 and just going strong. I was really pleased that I was able to steer a commission job to him, so he’s still at it. SG: I wasn’t able to help you too much about taking the class with Jerry, but the part I was telling you about coloring his stuff and the colors and getting his war stories to draw, I mentioned that to him very clearly and I was kind of unhappy about it because of the way I had to color it. I couldn’t color the great authenticity he was putting into the drawings. I couldn’t get it. Now you could do it. The coloring in the books, I see some things, how they’re colored. Sometimes they go too overboard on a lot of stuff. I can’t even see what the art work looks like. That’s one reason I stopped looking at it. I can’t follow it and the coloring is too heavy handed. There’s more grays and deep browns and burnt umbers and things like that and I can’t see the damned art work any more. Stroud: Yeah, you know Russ Heath told me the exact same thing because he’s still doing a little bit of work and he said once the colorist gets ahold of it it’s just a mess and he has no control over that. SG: Yeah, even on the humor stuff sometimes I complain about Archie. The people that color, they do the computer coloring of the covers. They get so heavy handed. I say, “Look, these are not for 40-year old guys with beards and want to see these dark colors. These are for the little girls that like pretty pinks and blues and yellows and lovely purples, not deep purples and you don’t need all these heavy colors in the background. You should tone them down.” It just bugs me sometimes what they’re doing on some of the covers. Stroud: Yeah, and to a trained professional like yourself I’m sure it’s more readily apparent than to those of us who just enjoy the finished product. Fantastic Four (1961) #48, cover penciled by Jack Kirby, inked by Joe Sinnott, & colored by Stan Goldberg. SG: Yeah. And especially, you know, I did all that color work and even occasionally some people want me to do certain things because they like my name on a recreation because half of the time I colored those. There’s just a few of us that are left. Jack is not around any more and the few of the guys that drew those covers are not around any more, but at least they get somebody that they can copy a particular style and they would get me because I was the original colorist on those books and when they put my name down I guess they can pay me a few more bucks to do it. And sometimes I enjoy doing it also. I say sometimes. They’re not paying me that much that I can retire and then live on an island someplace, but it’s almost like the fun I had coloring something that I colored in 1961, like the first this or the second issue of Thor or Fantastic Four #14 or things like that. It’s a good career and I’m still going strong. Stroud: Good for you and obviously you fall into that category where the work keeps you young. SG: It does. You could say that. I think it does because I can’t think of what else I would be doing because I stopped playing golf about 40 years ago and tennis, I took a couple of lessons and I found out I had work on my desk, so why should I be playing tennis? I had a family to support and I said, “I’d better do these pages before I go out on the courts and start hitting the ball.” So that was the extent of my tennis. (Chuckle.) I still take a lot of time off because that’s very important. My wife and I travel. We’ll be leaving for Mexico in a few weeks to this little town where we’ll spend two months. We’ll be doing that very shortly. Stroud: Fantastic. Right during the harshest part of the winter up there in the Northeast. That will be good. Stroud: (Chuckle.) You can’t ask much else. Mr. Goldberg, you’ve certainly been very kind and I appreciate your remembrances and your generosity. SG: And I’ll probably see Jerry very soon because this year the Reubens, the National Cartoonist’s Society will be going to New Orleans for about four days. I know Jerry comes down there pretty often and comes to these things if he’s feeling up to it and I hear he’s doing okay now and I’ll be seeing him. Another thing about Jerry; my son who got married about a year and a half ago lives in a house right next door to where Jerry lives in Manhattan. Stroud: It’s a small world even in the big city. When is the Reuben award thing happening? SG: They usually have it over Memorial Day* every year and this year it will be over in New Orleans and I’ve been there before and I love the place. It’s just a lot of fun and I’m sure the guys will have a good time. *Note: The Reuben Award weekend in New Orleans has come and gone, and according to Stan a good time was had by all. Al Jaffee, another good friend, was voted cartoonist of the year and Stan couldn’t have been happier for him. Stroud: I sure will. It sounds like the apple didn’t fall far from the tree. SG: He’s a good guy, but he was smart enough to say when he was 16 years old, I said, “Bennett, how about we work together?” He said, “Not right now, Dad. Down the road maybe.” Now it’s been 23 years or so later. He’s almost 40, I think. We did some nice work together on some new projects I was working on outside of comics that he and I put together and you’ll see it on my website. Stroud: I’ll be sure and check it out. It sounds a little like when Lew Sayre Schwartz was telling me about his son’s involvement in graphic design. It’s funny how that’s happened more than once. Stan Goldberg at his desk, 2008. SG: There you go. Just before we hang up the classic one whose son is just as good as his old man is John Romita, Jr. They’re both very good. They’ve got completely different styles and they’re both good guys. I remember John Jr. when he was a little kid and he’s turned out some major work and then he tells me, “No, Stan, I’ve been in the business 30 years.” “You’ve been in the business 30 years? I remember before there even was a John Jr. in the business.” So, they’re catching up on you. You’ve got to stay one step ahead of them. I said, “But John Jr., could you draw Archie?” He probably could, I think, because his old man could. One of the few guys that could draw humor and good serious stuff, so probably the apple doesn’t fall too far. Stroud: I’m sure you’re right. SG: So, on that note, you’ll send that out to me? I’d love to see it. Stroud: I’d be delighted to and thank you so much for all your help, Mr. Goldberg. SG: Sure. I’m glad I spoke to you. A lot of times I just feel like talking about an industry that I had some fun with. Stroud: And it’s obvious that you did. It comes across very well. Archie (1942) #602, cover by Stan Goldberg. 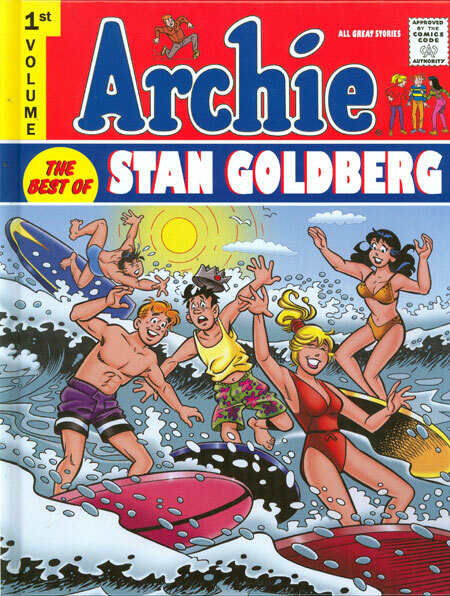 Archie: The Best of Stan Goldberg.